Aims to reduce risk associated with an investment in a particular asset class. Provide investors with a simple way to profit from, or protect against, a declining Australian sharemarket. It seeks to generate magnified returns that are negatively correlated to the returns of the Australian sharemarket (as measured by the S&P/ASX 200 Accumulation Index). Gearing magnifies gains and losses and may not be a suitable strategy for all investors. *Data is delayed by at least 20 minutes. **Certain additional costs apply. Please refer to PDS. *Calculated as the Fund's short exposure to the S&P/ASX 200 Acc Index as a percentage of the Fund's net asset value. **Represents the Fund's approximate exposure, for the above date, to movements in the S&P/ASX 200 Acc Index, as measured by the futures contract held in the Fund. 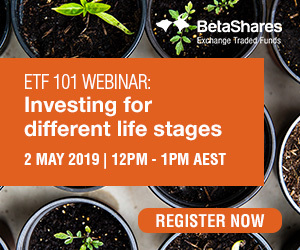 For example, if the Fund's Portfolio Exposure is -230% (or -2.30x) and the S&P/ASX 200 Index goes down 1% that day, the Fund would be expected to go up approximately 2.30% that day, before fees and expenses. The Fund is actively managed and the portfolio exposure will change on a daily basis, affecting returns over time." Past performance is not an indicator of future performance. Returns are calculated in Australian dollars using net asset value per unit at the start and end of the specified period and do not reflect brokerage or the bid ask spread that investors incur when buying and selling units on the ASX. Returns are after fund management costs, assume reinvestment of any distributions and do not take into account tax paid as an investor in the Fund. Returns for periods longer than one year are annualised. Current performance may be higher or lower than the performance shown. * As of 31 March 2019. Yield figures are calculated by summing the prior 12 month fund per unit distributions divided by the fund closing NAV per unit. Past performance is not an indicator of future performance. 1 This is the annual distribution return to the end of the relevant distribution date. The distribution return reflects the contribution to total investment return made by the Fund's distributions. It is calculated as the difference between total Fund return and NAV return. NAV return is the change in the Fund's NAV price. Total return is the NAV return plus reinvestment of all distributions back to the Fund. Past performance not indicative of future performance.